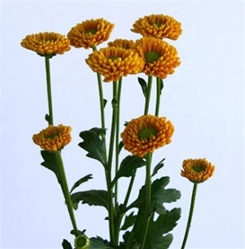 If you care properly for your Wholesale Micro Poms flowers, they should last at least a week in the vase. Micro Poms have rounded heads in a spray of about 3 to 5 primary blooms. Stems are 20-24 inches long, and usually have a number of smaller, less mature secondary blooms. Primary blooms are about 1.5" in diameter and secondary blooms are about 5/8" in diameter. Choose a color from the drop down menu above or order a beautiful grower's assortment of different varieties. Micro Poms are available year-round from our flower farms.